Jaya Ganguly (b. 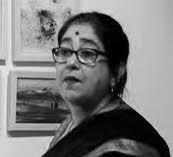 1958) is graduated from the Indian College of Arts, Kolkata in 1980. Figures, forms, objects, masks, landscapes in violent dislocation, all in the whirl of movement, constitute Jaya’s universe with blots and blocks of colour. Her first solo exhibition was with Academy of Fine Arts, Kolkata. Jaya Ganguly has had several gallery and museum exhibitions, including Womanhood-Through The Eyes of Indian Modern and Contemporary Art at the Tao Art Gallery, New Delhi (2015), Winter Oeuvre, Birla Academy of Art & Culture, Kolkata (2010). Nine Contemporary Artists from India, Gemeente Museum, Arnhem. She was invited to participate, Festival of India, Sweden in 1987. Her major collections are in Consulate of the Netherlands, New Delhi. National Gallery of Modern Art, New Delhi and in Delhi Art Gallery, New Delhi.